Immunization, also called vaccination, is one of the most highly debated topics in pet health care. Vaccines can protect your dog from contracting a variety of illnesses, some of which can be fatal. They are often administered by your veterinarian during a routine wellness visit. The controversy over pet vaccines seems to mirror the debate over of vaccines in human medicine. But the truth is that vaccines are an important part of your dog's overall health. What is a concerned dog owner to do? Should you get your dog vaccinated or not? Part of the problem here is the question itself. Rather than choosing between giving vaccines and skipping vaccines, it is wiser to think about the way your dog is vaccinated. Skipping vaccines altogether is not a wise choice. Vaccines truly do protect against disease. Unvaccinated pets are at a much greater risk for contracting deadly diseases and spreading them around. Diseases that are now considered rare could once again become widespread. In a nutshell, not vaccinating your dog at all is generally bad for your dog AND for the canine world. Just think about how many children were affected by the measles outbreak in 2014-2015. Vaccines prevent illness by enabling the immune system to create defenses against diseases. A vaccine has disease antigens that mildly stimulate the immune system without infecting the dog. The immune system then creates antibodies to fight off the real disease if your dog is ever exposed to it. Not many years ago, the standard practice was to vaccinate young puppies multiple times, then move adults to an annual vaccination schedule. However, newer guidelines were set in 2011 and then updated in 2017 by the American Animal Hospital Association (view PDF). These guidelines state that core vaccines may be given to adult dogs in intervals of three years or more rather than annually. Of course, puppy vaccines should still be performed about every three weeks between the ages of approximately six and 16 weeks. Many vets have adjusted their protocols to follow AAHA's three-year schedule for adult dogs. Certain non-core vaccines are still recommended annually for adult dogs. Furthermore, many vets are now customizing non-core vaccine protocols to fit a dog's lifestyle. First, the vet asks the owner about the dog's environment in order to determine the dog's risk of exposure. Then, a vaccination protocol is designed to protect the dog while minimizing risk. Although veterinarians stress that vaccines are generally safe for dogs, they know that vaccines are not without risk. 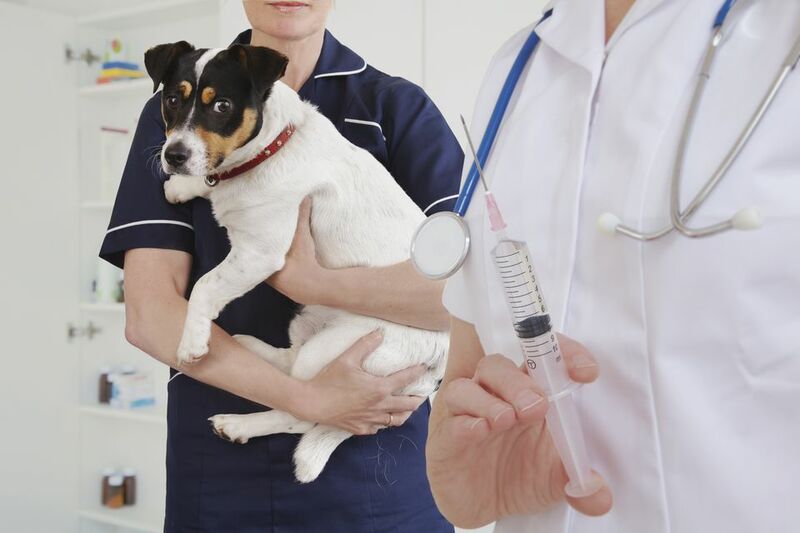 According to AHAA: "In general, all canine vaccines are quite safe and only a small percentage of vaccinated dogs, regardless of the type of vaccine, develop severe adverse reactions." If you wish to take precautions to minimize your dog's risk of complications, there are a few things you can do. Choose a veterinarian who follows current vaccine guidelines and pays attention to the types of vaccines used. Good vets choose the safest, most effective vaccines available. This is why buying vaccines to give at home is not a good idea. Your vet has the education and resources to find the best possible vaccine, not the cheapest. If your dog has reacted to vaccines before, your vet will recommend pre-treating with an antihistamine and possibly a steroid. This makes the reaction less severe (if the dog even reacts at all). Of course, it is also a good idea to observe your dog closely for the first 12 hours after the vaccine is administered (even longer if you are concerned). If you are concerned about stress on the immune system, you may opt to stagger the vaccines for your dog. This means having your vet administer one vaccine at a time, then waiting 3 or more weeks before giving the next kind of vaccine. You may choose a holistic/homeopathic vet if you want natural options to support your dog's immune system after vaccination. However, this does not mean you can skip vaccines altogether. A good holistic vet can help you choose the most natural options for your dog while minimizing the risk of disease outbreak in your dog and the canine population. Some vets perform vaccine titers to measure your dog's immunity against a certain disease. If titers show adequate immunity, it may be possible to postpone vaccination. However, not all vets agree on the proper use of vaccine titers. In addition, titer testing is usually significantly more expensive that the vaccine itself. When in doubt, do your own research, but remember to take what you read with a grain of salt. There are a number of websites out there with unreliable information written by untrained, uneducated individuals. If you see claims of "horrible vaccine dangers" and so-called "vaccine myths" that are not backed up by scientific evidence, you should probably leave that website. Instead, seek out the opinion of a trusted veterinarian, and keep the channels of communication open. What If Your Dog Has a Vaccine Reaction? Vaccines stimulate the immune system, so it is not uncommon to notice mild lethargy and sleepiness for about a day afterward. Some dogs will be sore at the injection site as well. Vaccines can cause allergic reactions in dogs though this is relatively uncommon. Many vaccine reactions are minor and self-limiting. Some reactions can be very serious and require immediate medical attention.